Ruthie - Horsman vinyl process evolved quickly. aprx 1960-1961 were making harder heavy vinyl dolls. 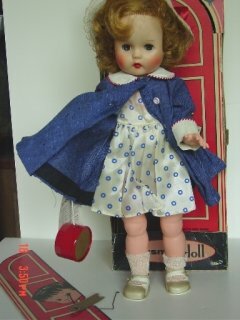 Found this in another source about Horsman dolls - link it here later. are as heavy as Heavy Vinyl I. Ruthies and look pretty much just the same. But touch them and their legs and arms are hard with no "give" at all. Next to impossible to tell from just a photo from Heavy Vinyl I. Head marks vary - It seems like these were transitional girls. 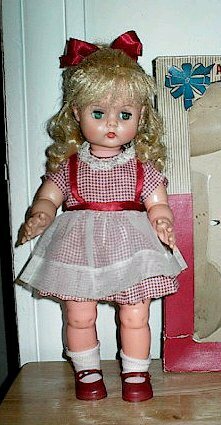 As all dollies had soft rubber like heads some of these bodies had heads marked like the Heavy Vinyl girls, and a few bear the T-series marks like the blowmold vinyl girls which come next. 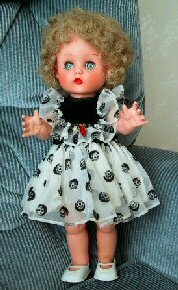 It is possible that they began making Ruthie by redirecting existing Love Me Baby heads to put on the new 16" vinyl bodies and then had to make a new production run of heads which then intitiated the T-series head molds. 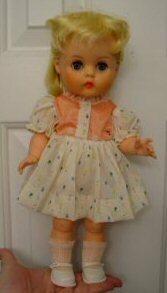 Horsman was quite elaborate in the variations - doll sizes are in heights from 13" to 18" in one inch increments - and have many hairstyles, hair colors and fashions. There are many pages devoted to Ruthies in this approximate time frame (1960-1961) in Patiki Gibbs book. The new blow mold process made vinyl dolls much cheaper to produce, and Ruthie being targeted for the mass market of course followed this trend next - Blow Mold Vinyl I dolls. Small Ruthies 13" - 14"